Virtual Hardware: The blog column that highlights some of the many items available for players to use in gaming, and why they’re either awesome or the worst thing ever. In most games that involve shooting, the gun you start out with is the one you can’t wait to get rid of. This lowly weapon seems to exist only to make you appreciate the weapons you’ll get later. Occasionally, a starting weapon will contain some characteristic that renders it useful throughout the entire game. Kyle Katarn’s Modified Bryar pistol from the Dark Forces series contains just those characteristics. At the onset of 1995’s Dark Forces, you’re infiltrating a top-secret Imperial base armed with only this seemingly insignificant pistol. It has a slow rate of fire, part of the barrel is yellow, and it wasn’t even in the movies! How can this thing deal with the might of the Empire? Though the game quickly gives you the iconic and more powerful E11 Stormtrooper blaster rifle, the practicality of that smaller pistol soon becomes self-evident. Pinpoint accuracy is a trademark of the weapon, ensuring it remains useful in large open environments where you can get the drop on your enemy. Plus, it consumes significantly less ammo per shot than other weapons. The gun’s rendering in Dark Forces is crude by today’s standards but manages to evoke the essence of some kind of “space revolver”. A rectangular protrusion on the left side of the weapon is obviously where the ammunition is fed into the cylindrical chamber of the weapon. The back end of the pistol contains a hammer assembly with some red detail that only hints at how the weapon actually operates. If Katarn is a rogue outlaw, the Bryar Pistol is the sidearm that never lets him down. 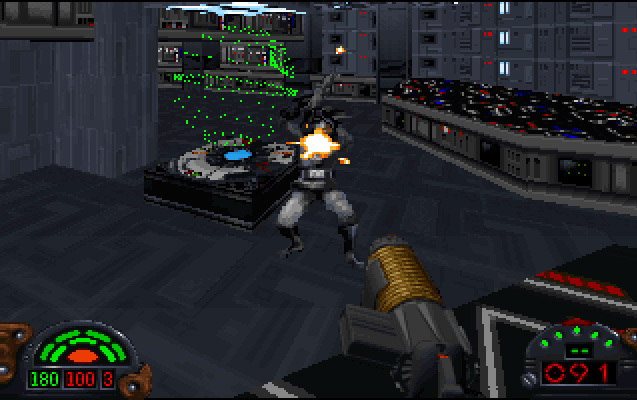 1997’s Jedi Knight: Dark Forces II features the second iteration of the weapon. Jedi Knight renders the Bryar in a fanciful three-dimensions, albeit in somewhat ugly fashion. Like every other object in the game, the weapons were constructed from a small number of polygons, relying on textures to add some details. As a result, the slight curves and elegance of the Bryar pistol were lost. Gone was the prominent protrusion on the left side of the weapon, presenting a sleeker if less interesting design. In spite of the rough render, movement animation makes the gun feel more lively than its first iteration. The game kept the weapon’s trademark yellow barrel and pinpoint accuracy, cementing its place as a most useful weapon in many of the games vast outdoor environments. It’s helpful that most of the enemies are dumber than a pile of rocks. You can snipe them with the Bryar from a half a mile away, and they’d never move. Jedi Knight also saw a prop rendering of the weapon in the game’s full motion video cutscenes. The physical model is a bit larger than I would have expected, but to me the size of it really cements the pistol’s iconic status as “not just another space gun”. If you’re one of the bad guys, you don’t want this thing pointed at you! In 2002, Jedi Outcast brought back the Bryar pistol in a big way: It now had an secondary firing mode. Holding down the alternate fire button powered up a charged shot which deals extra damage. This firing mode stacks on top of the pinpoint accuracy, allowing you to deal a punishing blow to your opponents. Stationary turrets and large targets like probe droids are much easier to deal with when you have a charged shot at your disposal. 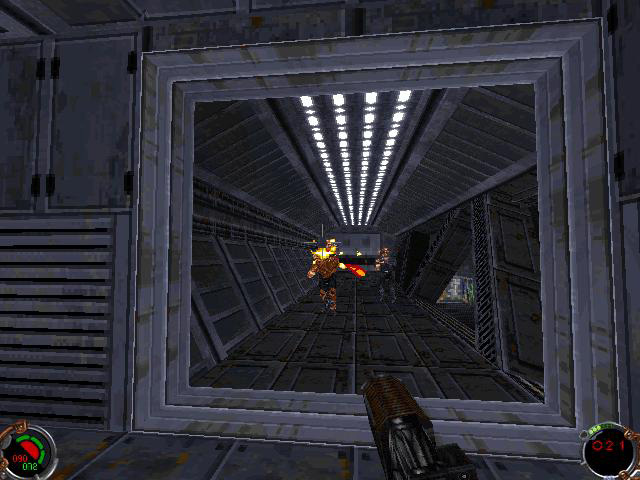 Outcast utilizes the Quake 3 engine, which means each item is rendered in more detail than was possible in Jedi Knight. The Bryar doesn’t look so ugly this time! Some design details were added in the form of tubing near the muzzle, though the rectangular protrusion on the side of the pistol was still conspicuously absent. 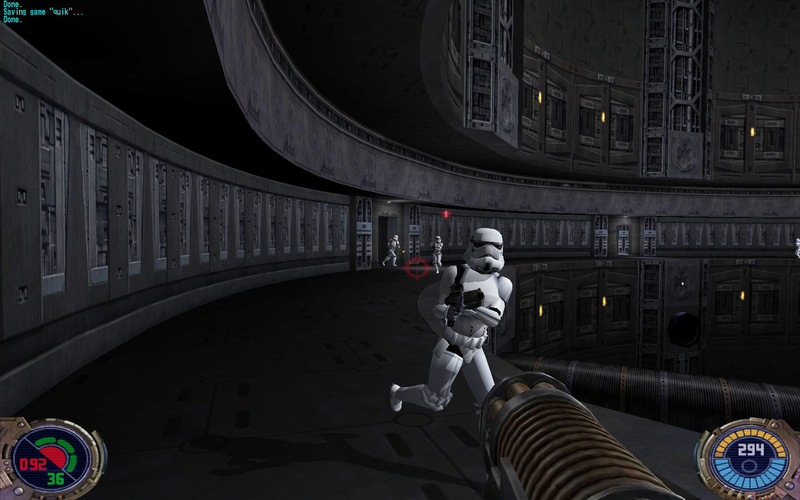 Jedi Outcast is the first game to show characters other than Kyle using the blaster, though none of them use it with the same effectiveness as Kyle. 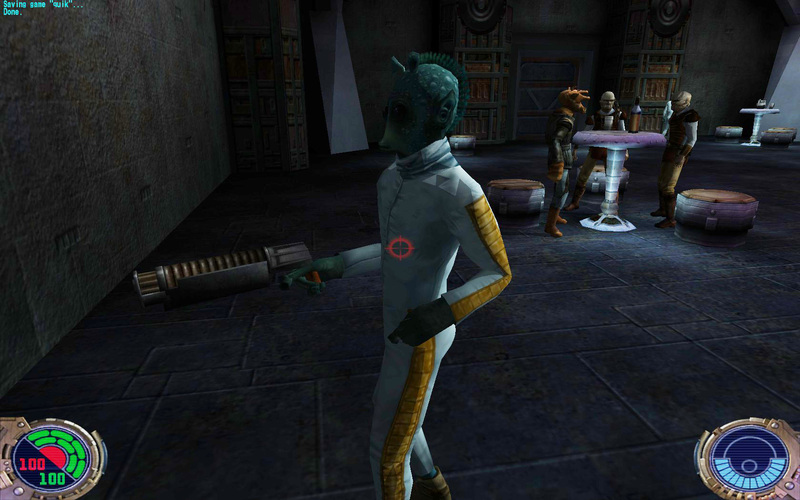 It’s also worth noting that Outcast is the only game where the Bryar pistol’s shot is colored straight yellow instead of the red / orange of other Star Wars weaponry. After Jedi Outcast I began to fear we’d never see the trusty Bryar pistol again. Though you could use cheat codes to spawn the weapon in Jedi Academy, the expansion to Jedi Outcast, it didn’t have a proper place in the main game. To my great surprise, 2015’s Battlefront added the Bryar pistol as part of its Death Star expansion. 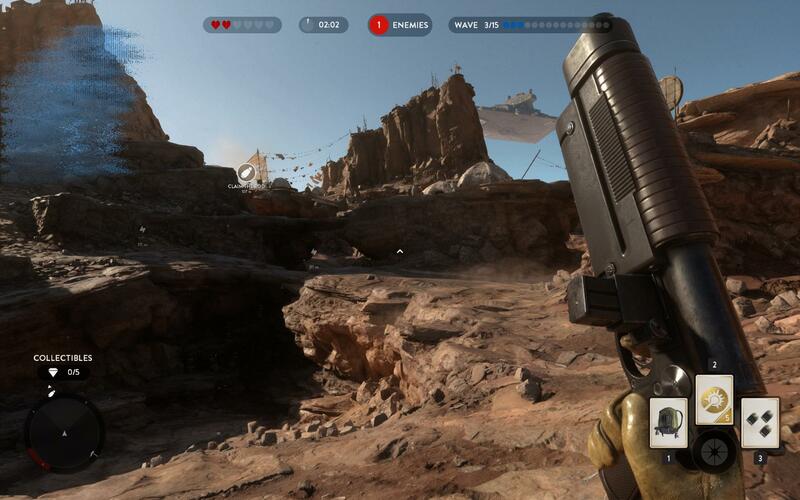 Battlefront called it the K-16 Byar Pistol, because for some reason Battlefront thinks every gun is more distinct if there’s a number in its name. Thankfully, this high fidelity design hearkens back to the original as shown in Dark Forces. This time, the protrusion on the left side of the weapon is clearly where energy packs are loaded into the pistol. Gone is the yellow blaster bolt from Jedi Outcast, though the secondary charged shot remains. It’s a bit slimmer than the gun shown in the video scenes of Jedi Knight. From a design standpoint, it’s slimmer, sleeker, and looks more like a mass-produced weapon of war. Though I understand the gun’s design needed some tweaking in order to fit the aesthetic of Battlefront, I think it lost something. The slimmer and more “realistic” design takes away some of the weapon’s character. It’s no longer a special gun for a hero, but a standard issue instrument of no real significance. Though Battefront takes away some of the magic of this gun, I’ll always think of it as an extension of Kyle Katarn’s mercenary persona. Cut down from a larger rifle, his pistol is a powerful and elegant tool in the fight against the scum of the universe. Versatile and fun to use, this may be my favorite weapon in the series. Sniping enemies from crazy distances? No problem! Stationary target that needs a blast shot? Got you covered! It’s the gun that never let me down. Well, except when I tried to use it against an AT-ST. Don’t do that. It doesn’t work. To be fair, I missed the shot here. But that still doesn’t mean it’s a good idea to take on an AT-ST with a pistol, especially when you only have 36 health.